Did you know that Oldfield has a ball machine that you are able to check out at the front desk at the Sports Club? There is no charge for the use of the machine. Juniors may not use the machine unless the are supervised by an adult at all times. The Oldfield Tennis Team Headed to State Tournament and took 2nd Place! 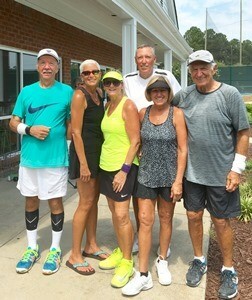 The Oldfield Ball Busters 7.0 mixed 55 and over USTA league tennis team headed to the State Finals in Florence, SC. The Tournament was September 9-11 with the team going in with an 8-1 winning record for the 2016 Summer season. Congratulations on this huge accomplishment. Go Ball Busters!